There are not many other places that i’d rather be than Chicago during the summer months, the city truly comes alive. There are beaches, parks, street festivals, and music going on all around you making it near impossible to decide what to do. But thankfully React Presents made it clear what the choice should be this past Fourth of July day weekend with their second installment of Mamby On The Beach! 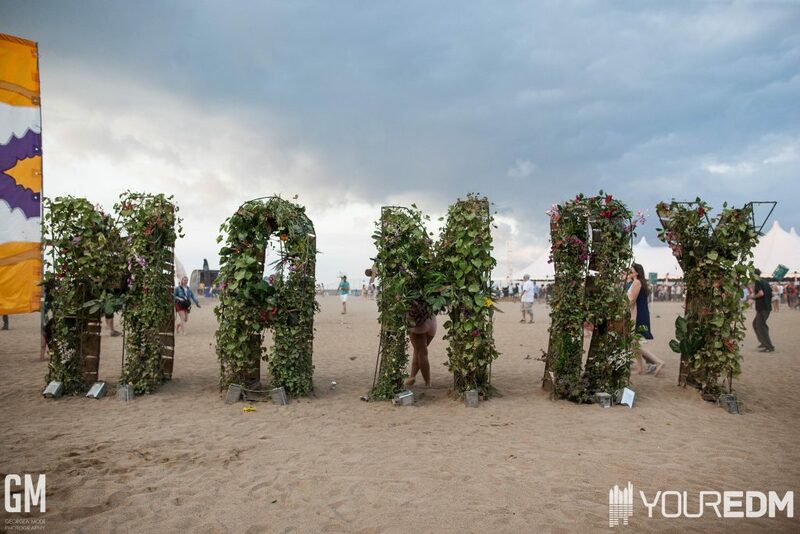 Taking place over the holiday weekend Mamby brought together a number of acts from varying genre’s to create the perfect atmosphere for this beach front festival. With names like Animal Collective, Lupe Fiasco, Loco Dice, Tale of Us, Chromeo, and Santigold all gracing the sand over the two day event. 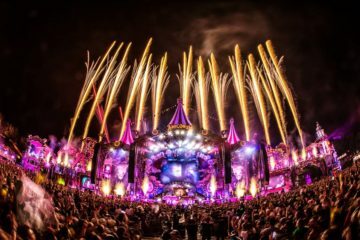 Coming off a successful wave with Spring Awakening, React really kept it going with Mamby this year. Upon entering the event the first day you are greeted with a long, grassy walk way to the beach that is filled with art and activities. 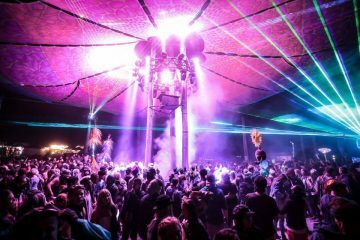 From the interactive wooden sculpture you can walk through, silent disco yoga, and varying little tents with henna, flash tattoos, tarot card reading, and more you can spend hours doing all of it before even making it to the music. When finally past the slew of attractions we made it on to the beach where people could be seen groving to music every where you looked. 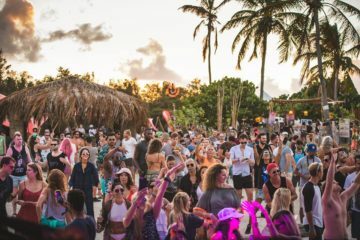 Whether it was under the Mixmag DJ tent stage or the Beach Stage or even at their newly added Park stage, it didn’t matter, the music was getting people going. As I stepped out onto the sand the sounds of Billy Kenny, a resident Dirtybird artist, could be heard from the tent in front of me. It was only natural that I was drawn towards that way first and it didn’t hurt that Hannah Wants was slated to play directly after and then Shiba San after her. The DJ tent made it increasingly more difficult to ever want to leave with the talent that it had on for the weekend. But I knew that it was time to check out the rest of what Mamby was serving up. 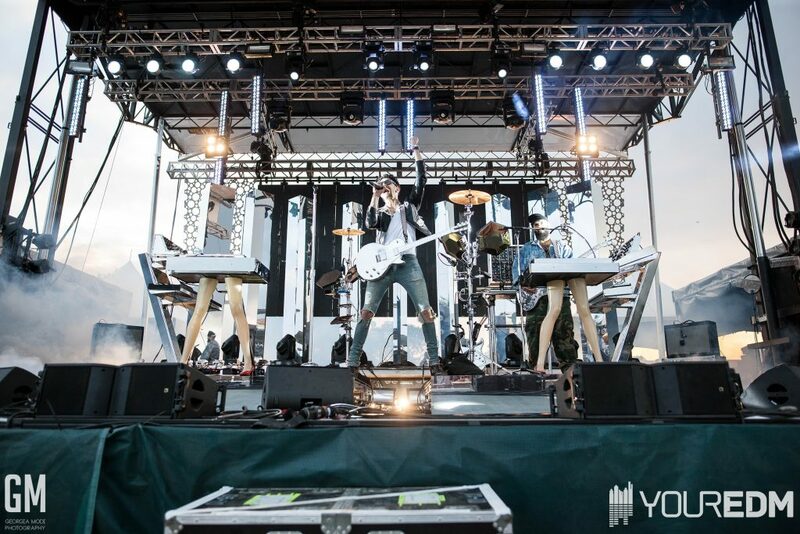 At their brand new Park Stage situated on the expanded section of the fest we had Lido busting out his music. 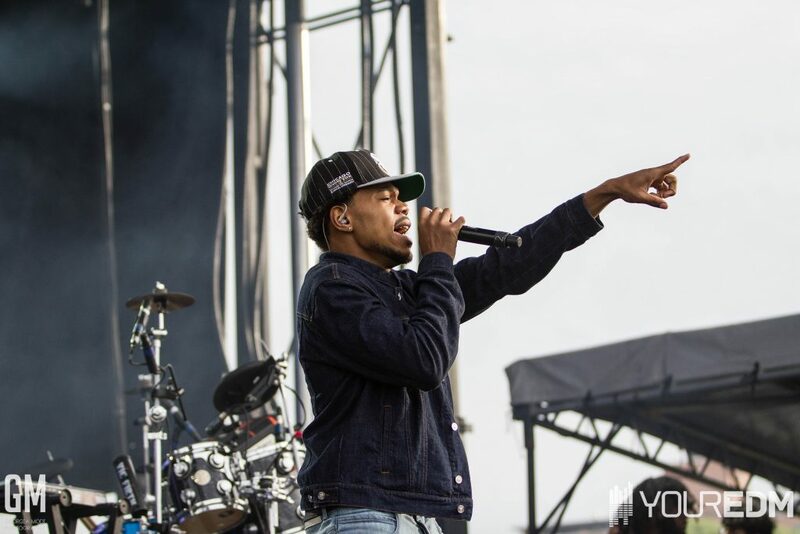 It was a treat during the end of his set when he brought out Chicago local, Chance The Rapper, as well as his fellow Save Money crew member, Towkio. It’s been awhile since I have seen a crowd that hyped up. The rest of the night only brought on more amazing music with Atmosphere on the Beach Stage leading into Milky Chance, Tale of Us closing out the DJ tent, and Animal Collective on at the Park Stage. I’ve always enjoyed Animal Collective’s music, a very out experimental sound. I wasn’t quite expecting what they played live however. It was much more out there than what I thought it would be and not as many songs as I thought I would recognize. A friend and I discussed it over the event and even he agree’d it was much weirder than what he was expecting, especially being a big fan of theirs. With day one under our belts I was excited to return on Sunday. There is something about Mamby that sets it apart from other React festivals. The mixture of the music, the vibes of the crowd, the beach front location, all of it plays into setting itself up for success. You feel a level of heightened respect from the attendee’s around you, something you don’t often feel at a festival with you’re typical EDM lineup. Its why, even after a full night of partying, I was so ready to feel the sand between my toes again. I touched down on the beach just a bit before 5 o’clock, a perfect time in my opinion, the sun is still shining but the heat has started to cool down, and the music is getting deliciously good. Another hometown favorite was taking over the decks at the DJ Tent when I arrived; The Black Madonna, was a can’t miss for me. Especially when she led into another amazing string of music underneath that very tent with Steve Bug, Derrick Carter, Martinez Brothers, and, closing it out, Loco Dice. For anyone who is a lover of house or techno and was there at Mamby last weekend you know how hard it was to pull yourself away to try and see anything else. But I knew I had to try and get a taste for the other artists that were on stage that day. With Lupe Fiasco on at the Park stage I made my way over, another Chicago favorite of so many. With Lido brining out Chance the day before it was a treat again to see Lupe bring out Matthew Santos to sing “Superstar”. It was also a somber moment during Lupe’s set when he began discussing a major issue that plague’s Chicago, it’s murder rate. He spoke out against it and how we cannot let things like this continue. His words rang true for many in the audience. For someone of great influence it is amazing to see them using their words to try and invoke any kind of change. While I wish I could have stayed for more of Lupe’s set I made the choice to head to the Beach Stage to be able to catch the end of Chromeo’s set. 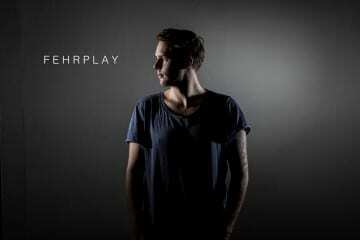 It was the right kind of groovy, electronic for the beach when the sun was setting. I made it just in time to hear their song “jealous” being belted over the speakers and to see everyone digging themselves a hole in the sand from dancing nonstop. The lineup for closing sets was a tough one with Chet Faker, Loco Dice, and Santigold all slotted to play against one another and as much as I wanted to go check out Santigold the group of friends I have dancing over at the tent for Loco Dice. 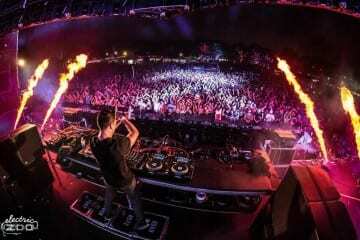 While his set wasn’t the best one I had seen from him I still had a great time being surrounded by everyone. Mamby has that magic of just making people smile. From the interactive activities, to the sand covering our feet, the amazing food, music, and experience I don’t think anyone in attendance could have asked for a better time for their Fourth of July day weekend. React Presents is doing it right with this one and I can’t wait to see them hit it out of the park for years to come. Check out the album of photos below and to see the full one and be able to tag yourselves check it out here! 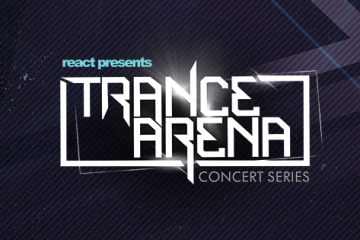 Win Tickets to Trance Arena in Chicago Featuring ATB, Orjan Nilsen, Ben Nicky, and More!